… Emanuela Marinelli fell in love with the Shroud. Tough love: nearly forty years of study. And 17 books, hundreds of articles, thousands of conferences, from Indonesia to Kazakhstan to Burkina Faso: long journeys, sometimes dangerous, always with a copy of the Shroud folded into the suitcase, to go on to explain, the ends of the world. In 1977, the Swiss botanist Max Frei made public the results of a search on the pollen of which had found no trace on the Shroud: over 58 types, 38 belonged to plants of Palestine that does not exist in Europe. The most frequent pollen were identical to those found in the sediments of the Sea of ​​Galilee. In Emanuela Marinelli, then a young graduate in Natural Sciences and Geology at the "Sapienza" of Rome, the discovery sparked a deep interest. Pollen from Palestine, as a signature on the relic that since 1933 was not exposed to the public. The Marinelli knocked Centre Roman Sindonology Monsignor Giulio Ricci, began to study. He learned that at the heel of the stranger wrapped in the cloth was no sign of a kind of aragonite, the same as that found in the caves of Jerusalem. 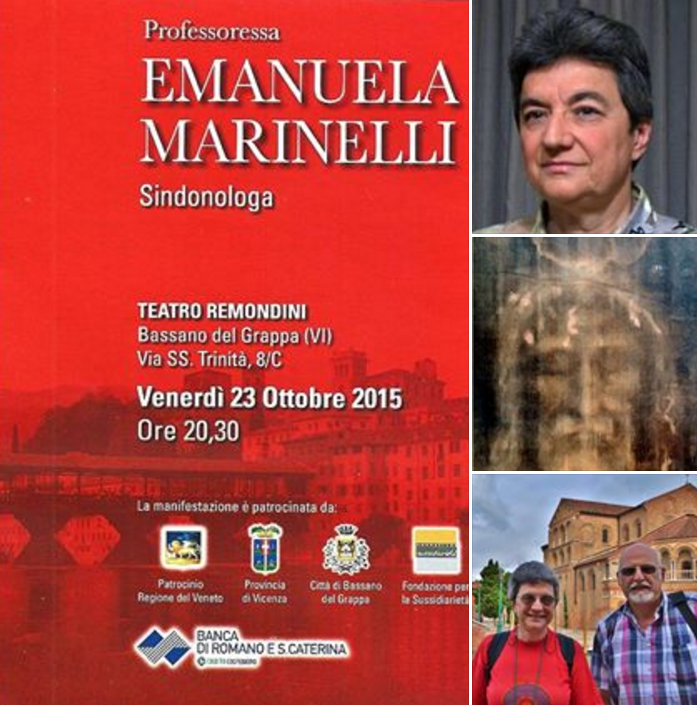 And Emanuela Marinelli fell in love with the Shroud.Tough love: nearly forty years of study. And 17 books, hundreds of articles, thousands of conferences, from Indonesia to Kazakhstan to Burkina Faso: long journeys, sometimes dangerous, always with a copy of the Shroud folded into the suitcase, to go on to explain, the ends of the world. For this passionate outreach activities Professor receives 23 October in Bassano del Grappa the prestigious International Award for Culture Cattolica.La we meet in a cafe in Rome. Youthful, lively, the way he talks it is clear that falling in love for the Holy Shroud continues, since that distant day when, say, a copy before she found herself without words: "It seemed to me – he says – a Gospel written in blood." But it was 1988, the year of the famous test using carbon 14 on a piece of cloth: the Shroud, or so it was said, to the test of science. From the laboratories of Oxford, Tucson and Zurich came the verdict: the sheet went back to the Middle Ages. A trenchant outcome, which seemed to sweep away centuries of hopes to have, still, a material trace of the passage of Christ on earth. Almost everyone at that point, as he wrote Vittorio Messori, bowed, devout, in "St. C14." Not everyone, however. Emanuela Marinelli: "The angle of the sheet material to be analyzed turned out to have been manipulated, patched, polluted by fungi and bacteria. If the sample was contaminated, the date could refer to the tracks left by dust and manipulation. " They supported him then, moreover, distinguished scholars like Gove. The shadow that science seemed to have dissipated, actually remained.Although, says Marinelli, "he is felt a desire to deny the historicity of the Shroud, regardless of any element emerged from the research. An ideologically motivated denial: perhaps because, as Cardinal Biffi said, if the Shroud is false for a Christian does not change anything, but if the shroud is real, for atheists change many things … ".The ‘truth’ absolute sentenced by Carbon 14 was for Marinelli, who had a degree in Natural Sciences with a thesis on the radioactivity of uranium, a challenge to study again. That was when he published the first of his 17 books, exploring every search, every word spoken on the Shroud. Because much yet, according to her, it was not clear. "The fabric – he says – shows a selvedge and seam details, and is comparable to the tissues found years ago at Masada, and dating back to the first century after Christ. The analyzes show that there is blood in your wound; other analyzes show that a body lay in the towel for 36/40 hours. But there is no trace of the drag that should appear, if the body had been removed. " "He knows what scholars, although atheists and ‘deniers’, admit that the Shroud was wrapped a man? Doctors and artists: the first because they recognize that this is blood, the latter because they understand that this is not painting. The experiment more significant, however, was conducted in Italy, Enea. An excimer laser was focused on a tissue, and the effect is the closest thing we have to the image of the Shroud. The fabric is yellowed, as had been crossed by a fortissimaluce. " The faith does not affect his studies? We ask. Her calm: "No. Pollens, aragonite, the selvage of the fabric, are all facts. Today we can say that the test of carbon 14 is not enough to deny the authenticity of the Shroud. " You can, in your opinion, conduct new tests reliable? "I’m afraid not, because the fire which escaped the cloth closed in a box, in 1532 in Chambéry, it can still contaminated, and this will alter the results of the carbon." The Shroud, then, is it for you? "An image still unexplained, leaving us on the threshold of an enigma. How Arpino wrote: ‘In a world that is bulging of monuments, pyramids, coliseums, triumphal arches, equestrian statues, temples untouched or corroded by mold and neglect, on this planet only a linen cloth, with quell’Orma preserves its mystery ‘. But this, in his poverty, continues to call men. The Shroud is an icon of human suffering. People, when I go to talk, I listen to is everywhere: in the most distant regions of the world, in schools, in prisons. " But one evening an elderly woman, after the conference, got up from the floor. It was modest Southern Italy, with his hands spoiled from family work. "Professor – he said – I did not understand much of the carbon 14, however, one thing I realized. I understand that we must become like the Shroud, we stamparci into the image of that suffering face, to take him to those we meet. " And that time was the teacher, moved, to remain silent. the ancient cloth (= a way of destructive analysis!). impossible to apply in the case of the Shroud). survey for molecular chains of cellulose. in 1997 [working on cellulose crystals]). “AFM three-point bending test”, etc., etc. AFM-Raman and SERS controls, etc. Biophys J. 1993 Mar; 64(3): 735–742.